If Livermore businesses have been cited for California fire code deficiencies or if you feel your business might be cited, call AAA Fire Protection Services at (800) 543-5556. We can help. We have over 40 years of experience helping businesses just like yours to overcome fire code citations and to become compliant with California's complex fire code. We are an honest company who brings integrity to every transaction. In addition, we offer comprehensive fire extinguisher services that exceed the expectations of California Code of Regulations. Our fire extinguisher services include mandatory annual fire extinguisher evaluations which also include updated tagging for each unit that we inspect. We also offer complete fire extinguisher sales, which helps businesses put in place the proper type of fire extinguisher and in the proper size. Not all fire extinguishers are the same. Some are specialized for specific types of fire such as grease fires or electrical fires. 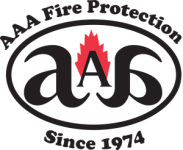 If you're ready to work with a professional company who understands the California fire code, then just give AAA Fire Protection Services a call at (800) 543-5556.